Nine years after launching a viral video parody of Nestlé’s Kit Kat brand, the environmental group, Greenpeace, has released another video, this time highlighting Nestlé’s extensive use of plastic packaging. 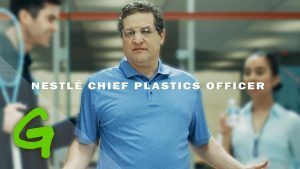 In the social video, Nestlé’s “Chief Plastics Officer” heads to a vending machine for a refreshment after a game of squash, but instead of receiving a plastic bottle, he comes face to face with a menacing, plastic-spewing vending machine monster. The video ends by showing a man walking on a sea of plastic waste – footage shot during Greenpeace’s recent ship tour in the Philippines. In 2018 Nestlé produced 1.7 million metric tons of plastic packaging, a 13 percent increase from the 1.5 million metric tons they produced in 2017. This is not the first time Greenpeace has used creative tactics to raise awareness about Nestlé’s environmental impact. In 2010 Greenpeace targeted Nestlé as part of its campaign to stop the use of unsustainable forest clearing in production of palm oil, parodying the company’s “Have a break; Have a Kit Kat” slogan to critical acclaim.